FromSoftware’s newest trailer for Sekiro: Shadows Die Twice featured yet another boss fight, this time having the One-Armed Wolf preparing to do battle with the Lady Butterfly. One of FromSoftware’s specialties is setting up memorable boss fights against enemies that range from huge monstrosities to human-like foes with supernatural abilities. Lady Butterfly appears to be one of the latter with the boss being an older, nimble woman who’s found inside a burning building. Thin wires are suspended at different points throughout the building that the Lady Butterfly is shown hopping on and off, so you can bet she’ll use those in a boss fight to maneuver around players. Though the trailer only shows what appear to be the opening segments of the fight, likely when the player makes their way into the building and first encounters the enemy, previous gameplay footage showed off more of the boss fight. Game Informer’s coverage of Sekiro: Shadows Die Twice while working with FromSoftware showed that the boss can indeed move with tremendous speed and uses those wires to navigate the battleground. Though she’s fast and attacks quickly from the air and on the ground, players have to keep on the offensive instead of just being reactive to wear down the boss and perform a devastating blow. FromSoftware’s preview of the Lady Butterfly boss fight follows other teasers shared recently ahead of the game’s March release that showed off more of the diverse enemies players will encounter. 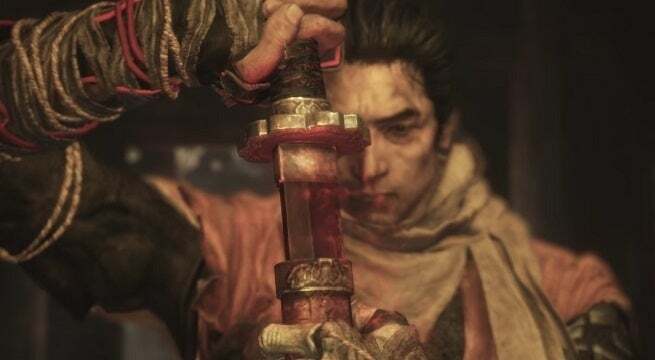 Gyoubu Masataka Oniwa is another boss players will find in Sekiro: Shadows Die Twice, an opponent who looks to be one of the signature larger-than-life enemies the developer is known for. While still humanoid in appearance, the figure appears to be pretty large and is riding on an equally intimidating horse as it charges into battle with a huge polearm. A story trailer released not long ago ties together some of the references seen in this boss fight preview and can be seen here. Sekiro: Shadows Die Twice is scheduled to release for the PlayStation 4, Xbox One, and PC on March 22nd.